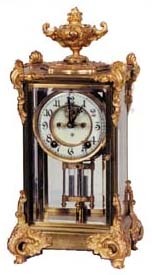 Ansonia Clock Co. crystal regulator, "Marquis", ca 1904. One of the best crystal regulators I have ever had. It is not perfect, but the rich gold ornaments still have most of the gold intact. The brass box is also good but a light polishing would help. It stands 15 1/2 inches high and is all original. The movement is 8 day, half hour gong strike, 2 piece porcelain dial with open escapement, 4 beveled plate glasses with nary a corner chip. Most unusual. This is a keeper. Ly-Ansonia No.334.